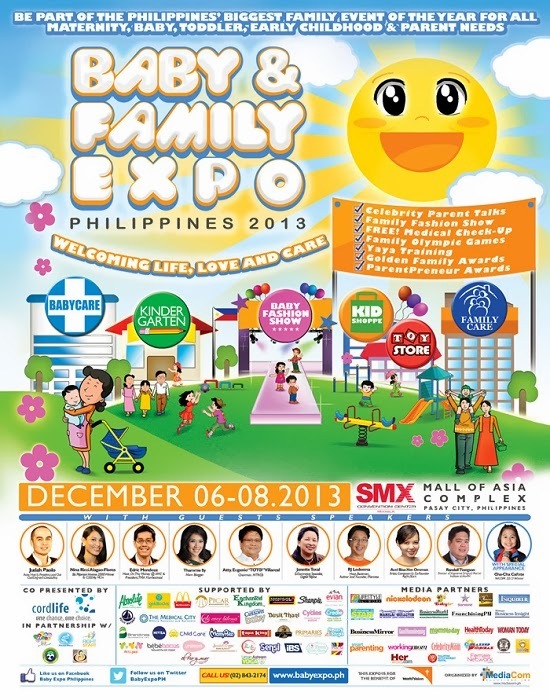 The biggest family event of the year, Baby & Family Expo Philippines 2013, happening on December 06-08, 2013 at SMX Convention Center Manila, Mall of Asia Complex, will be recognizing celebrity families, parents and kids who have been a great inspiration and role model to Filipino families in the first ever Golden Family Awards. The awarding ceremony is scheduled on Saturday, December 7, 2013, 6pm. The Golden Family of the Year will be awarded to celebrity parents Judy Ann Santos and Ryan Agoncillo and to daughter Johanna “Yohan Lois" and son Juan Luis "Lucho." Their on-screen love team developed to an off-camera relationship. Four years after, wedding bells were finally heard. Despite rumors, their relationship stayed strong. Aside from their successful showbiz career, Judy Ann and Ryan still managed to be hands-on parents. When it comes to enforcing discipline to their kids, they prefer to handle it on a case-to-case basis instead of imposing cardinal rules. Both parents are open to possibilities of their kids entering showbiz as Yohan and Lucho are showing signs already. Celebrity couple Regine Tolentino and Lander Vera-Perez will be awarded as the Golden Couple of the Year as their relationship is one of the perfect examples of a relationship that withstood trials and emerged stronger after the storm. Actress and dancing diva felt love at first sight for his on-screen partner Lander Vera-Perez, who was a heartthrob then. But the on-screen love team became a real life relationship. They are blessed with two daughters Azucena Reigne and Alessandra Reigen. Queen of all media Kris Aquino’s son James “Bimby” Aquino Yap and Little Miss Philippines 2012 Ryzza Mae Dizon will be crowned as this year’s Golden Kids. Following the footsteps of his mom, Bimby is now very active in showbiz print and television commercials plus with an upcoming movie together with award-winning child actress Ryzza, who have been on demand ever since she won in the noon-time show pageant for her unique wit. Currently, she hosts her own show. Celebrity parents will also be present during the expo to give inspirational talks. Host, author, columnist & Mercato founder RJ Ledesma will share tips on Daddy 101. Azkals coach Michael Weiss will talk about ‘Coaching the Azkals and Coaching Your Kids’. On The Money host and president of The Master's Academy Edric Mendoza will talk about Homeschooling. Bb. Pilipinas- Universe title holder and actress Nina Ricci Alagao-Flores and dancing diva Regine Tolentino will give a talk on Parenting 101. Former vocalist of Moonstar88 Acel van Ommen and Starstruck avenger Jade Lopez will give an advocacy talk for Right Start. Former beauty queen turned actress Maria Isabel Lopez and MTRCB board member and actress Gladys Reyes-Sommereux will also be there to sell their pre-loved clothes/items and other stuff to the expo goers, a portion of which will be donated to the Yolanda victims. The Golden Family Awards is part of the three-day fun-filled event organized by MediaCom Solutions Inc. and co-presented by Cordlife Philippines, the leading cord blood and tissue banking service provider in the country. The Baby & Family Expo Philippines dubbed as “Welcoming Life, Love and Care”, is dedicated to nurture family development and child care. It covers the stages of family growth from pregnancy, maternity, newborns, toddlers and early childhood. The event will also feature educational talks and seminars, exciting activities like Family Olympics and Family Fashion Weekend and exclusive discounts from over 200 exhibitors. Be part of this star-studded family event by registering for free at the Baby & Family Expo Philippines 2013 website www.babyexpo.ph. For queries and updates, call +632.843.2174, email info@babyexpo.ph and join the community at www.facebook.com/babyexpoph and www.twitter.com/BabyExpoPH.